In order to prevent the vehicle's battery from discharging, the interior lighting functions are automatically deactivated after some time unless the SmartKey is in position 2 in the ignition lock. The brightness of the ambient lighting may be set using the control on the instrument cluster . : set rocker switch 6 to the center position. The interior lighting remains switched off even when it is dark if you: • unlock the vehicle • open a door. When a front door is opened, the front interior lighting comes on. When a rear door is opened, the rear interior lighting comes on. In addition, the courtesy lights come on. If a door remains open and the SmartKey is not in the ignition lock, the interior lighting switches off after a short while. If the interior lighting has been switched on manually, it will not be switched off automatically. This can cause the starter battery to discharge. Make sure that the interior lighting does not remain switched on too long after the engine has been switched off. symbol on rocker switch 6. Make sure the tailgate is closed when the engine is running and while driving. Among other dangers, deadly carbon monoxide (CO) gases may enter vehicle interior resulting in unconsciousness and death. 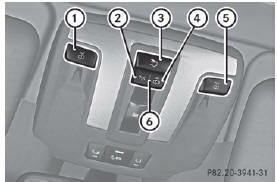 Switch off the cargo compartment lamp if you wish to leave the rear door open for a longer period. The battery may otherwise discharge. Do not close the rear door while lock 1 is engaged at the bottom. Otherwise, you could damage lock 1. Switch off the cargo compartment lamp if you wish to leave the rear door open for a longer period. This prevents the battery from discharging. press lock 1 down in the direction of the arrow until it engages. The cargo compartment lamp is switched off. 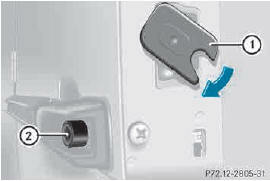 press lock cylinder 2 on the door handle. The cargo compartment lamp resumes its normal function. Switch off the rear interior lighting if you wish to leave the rear doors open for a longer period. This prevents the battery from discharging.